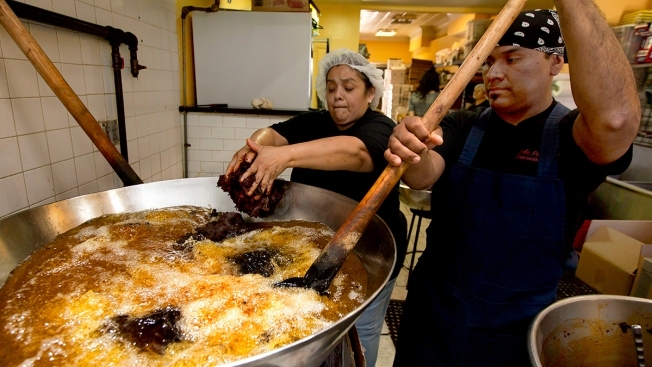 Three generations of women in the Bravo family make 1,600 pounds of mole poblano to sell to New York restaurants, bodegas, and supermarkets. Christina Mora and Franco Hernandez start a new batch of mole at the headquarters of Mole Poblano Asuncion Corp., in the Bushwick neighborhood of Brooklyn borough of New York, Tuesday, July 31, 2018. This family-run business, that produces about 1,600 pounds of mole a day in a small Brooklyn store, has grown due to the three generations of a matriarchy that produce the dark-hued paste of ground chilies and a dozen other ingredients. The aroma of toasted almonds and sesame seeds, chiles and spices emerges from this small Brooklyn store where about 1,600 pounds of mole poblano is made every day. Three generations of Mexican women work inside, wearing white hairnets while they peel, cut and grind ingredients, standing next to enormous two-handled pots with onions and garlic boiling in oil. “There is so much to do,” says Damiana Bravo, a petite woman of nearly 80, when asked why she still works. The matriarch started making the Mexican sauce in New York in the 1970s to sell it to her fellow factory workers. Now, her dark-hued paste of ground chiles and a dozen other ingredients is distributed to bodegas, supermarkets and restaurants in New York, Pennsylvania, New Jersey, Connecticut and North Carolina. Members of the family-run business of Mole Poblano Asuncion Corp. pose for a photo in their small store in the Bushwick neighborhood of Brooklyn borough of New York, Tuesday, July 31, 2018. They are, standing from left: Canny Rojas, Sally Rojas, Jesse Hernandez, Christina Mora, Franco Hernandez and Candida Fuentes. Seated in front is Damiana Bravo who will turn 80 in September. She started making mole in New York in the 1970's to sell it to her fellow factory workers, who would occasionally ask for it. Now, mole poblano "La Asuncion" is distributed to bodegas, supermarkets and restaurants of New York, Pennsylvania, New Jersey, Connecticut and North Carolina. Preparing the sauce, a staple of Mexican culture, is not for the fainthearted. It takes two days to make and involves the seeding and toasting of dried chiles, the frying of almonds, the grinding of sesame seeds, and the cooking of dozens of ingredients, including chocolate, sugar, cinnamon, peanuts and a several herbs. 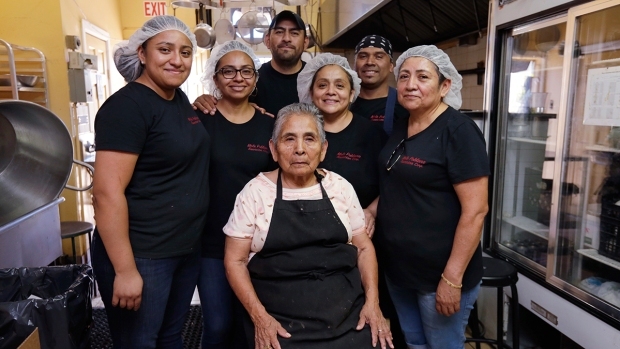 Year after year, the family-run business on Knickerbocker Avenue uses the recipe Bravo’s mother used to make in Piaxtla, a town of about 5,000 in the state of Puebla. Bravo, her two daughters and two granddaughters still use pasilla and mulato chiles as key ingredients. The result is a mole not too spicy, not too sweet, that resonates among Mexican-food lovers. According to Mexican government data, there are about a million people of Mexican origin in New York, New Jersey and Connecticut, and nearly half are from Puebla. “When I first tried their mole, it brought me childhood memories,” says Arturo Leonar, who has bought Bravo’s mole for the last 12 years for his restaurant, Chavelas, in Brooklyn. Bravo moved to the U.S. from Piaxtla in the 1970s. In the ’80s, three daughters and two small granddaughters joined her in New York. The family’s mole production increased considerably about 15 years ago, when the two granddaughters, Sally and Canny Rojas, spread the word about the business. They were forced to learn how to drive so they could distribute mole in the Bronx and other neighborhoods. Now, several men help the women in the family. Two grandsons stir the heavy paste in the pots, and Sally’s husband and a great-grandson of Bravo’s drive a truck to distribute the sauce. On a recent Tuesday morning, a Spanish-language telenovela played on a small TV on the corner while the women worked alongside one another with methodical repetition. They placed the mole in small plastic containers. They peeled garlic. They ground sesame seeds in a big, rudimentary mill purchased in Puebla and transported to New York. Bravo attached stickers that say in red letters, “Mole Poblano Asuncion Corp,” to small plastic containers the family sells for $6.50. A 25-pound container costs $162.50. Bravo’s family calls the sauce “La Asuncion” to honor Piaxtla’s patron saint, Our Lady of the Assumption, and hope to find a bigger space to make it. They also hope to sell online soon.